If you're a fan of ice cream, and giveaways, you're in luck. Ben & Jerry's will be handing out free cones Tuesday from 12 p.m. to 8 p.m. at its hundreds of Scoop Shops across the nation. 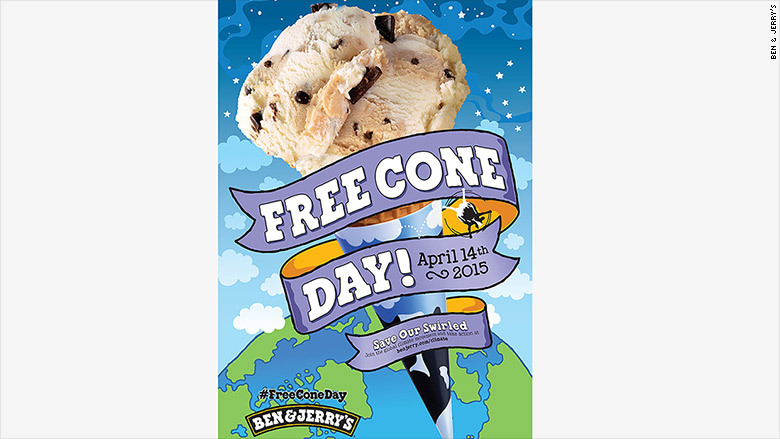 The Vermont-based company has been celebrating "Free Cone Day" every year since 1979. "It's our biggest holiday!" said chief marketing officer Dave Stever. "We get to thank our fans by showing them that we love them by giving away over a million scoops of ice cream." In addition to thanking customers, Ben & Jerry's says it's hoping to raise awareness about "climate justice." Ben & Jerry's is calling on ice cream fans to urge global leaders to tackle climate change. The company is pushing for policies that will lead to 100% clean energy by 2050.